Activia yogurt is a product of Dannon yogurts that contains a specific variant of Bifidobacterium called Bifidus Regularis. Activia yogurt is made from sour milk. Activia is classified under functional foods that have been manufactured to improve the digestive tract health. Functional foods are either natural or processed food that are instigated with bio-active compounds that have clinically proven and registered health benefits. Activia yogurt was introduced in France in 1987 and now this product is available in over 70 countries. In the 1980s, yogurt was becoming a smart new trend in the Western diet. So when Dannon introduced activia yogurt that claimed to cure vaguely defined belly troubles and he stated that those claims could be scientifically proven, activia turned into a million dollar grabbing product. These days most of the youngster choose the food they eat depending on how much they like the advertisement and packaging of the product instead of the health benefits and nutritional value of the product. The new generation can be divided into two categories: the junk food junkies and the calories counter. The junk food junkies don’t care about what they eat as long as there food cravings are satisfied and the calories counter are more obsessed with the calories in there food and the effect it will have on their waist line than on the nutritional value. Due to this, most of the youngsters have calcium and vitamin deficiency that eventually leads to severe problems. So improve your diet, do yourself a favor and pay attention to the food you put in your body. A heath diet leads to a health body and mind that in turn insures a happy life. These days we are eating more and more packaged and processed foods, but do we really know what we are consuming? International companies pay millions to advertisers to come up with a funky logo, catchy slogan and eye catching adds, this is a subtle way of implanting the desire of the product to our subconscious. Now a days, people especially teenagers, eat the products that have and appealing packaging, they mostly won’t even look at the ingredients. Another main fact in choosing food for teenagers is “trend”, teens think that if they eat the food that is popular on social media then it will make them cool. But what people don’t consider is that everyone has adifferent body type with different needs and requirements, so a person should consume food accordingly. Most of the people eating activia yogurt don’t even know what activia actually is. Activia is a probiotic that has been genetically engineered by the scientists working at Dannon. Activia is made from Bifidus Regularis that is a variant of Bifidobacterium, which is present is most mammals along with humans. Regularis means “regular” and the “is” at the end is a scientific derivation. “Bifidobacterium animalis DN 173 010” is the scientifically correct name of the bacteria used in activia yogurt. Activia is a probiotic that is said to increase the good bacteria in your gut to help in better digestion. Activia was introduced by Dannon in form of yogurt but it did not gain instant popularity. But, now its use is becoming a global trend. Knowing the nutritional value of the food you put in your body is your duty. A proper diet is necessary to maintain a healthy life. 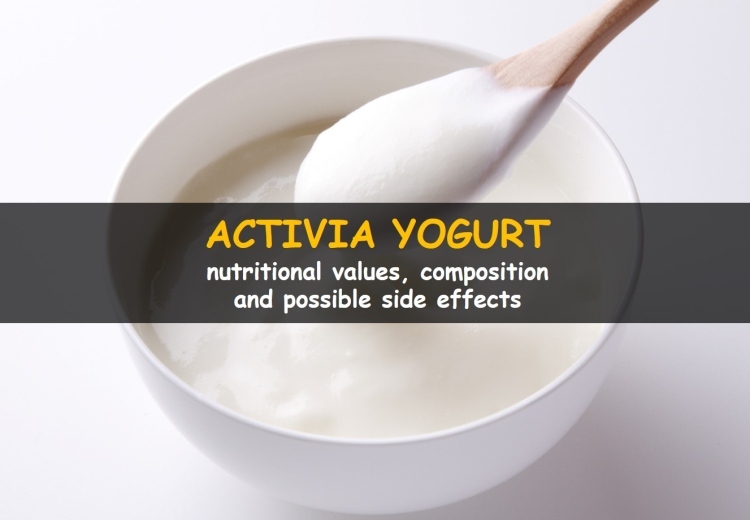 Activia yogurt does not contain any vitamins and the only trace elements it contains are sodium and potassium. The main nutrition composition of activia yogurt are calories, proteins, fat, sodium and potassium. If you give it a thought, you would come to know that all these ingredients are actually just fillers, not what your body actually needs. Activia yogurt can fill you up but it certainly cannot fulfill the nutritional requirements of the body. Most of the people that consume activia yogurt don’t even know what activia is, so they only eat it for its probiotic effect. They consume activia as a part of their weight reducing or weight maintain diet. Even though activia yogurt is a milk based product but it still does not contain sufficient amount of calcium. Eating foods with low nutritional value is well and good for a short time but after a while the nutritional deficiencies start to pile up and lead to serious and potentially fatal diseases. Activia: Activia is a probiotic that is the main ingredient in activia yogurt. Activia is synthesized from Bifidus Regularis that is a variant of Bifidobacterium. The bacteria in activia are said to help better regulate the enteric system (gut). Activia was made by the scientist that worked in the research department of Dannon yogurts. Reduced fat milk: 1% low fat milk is usually used for making activia yogurt. Whole milk that is obtained from a cow contains about 3.5% fat. The fat content of the milk is removed from it by various processing techniques. According to international standards, when the fat is removed from milk there should be not alternation the nutritional components nor should water be added to the milk. Sugar: The sugar used in activia are fructose, aspartate or sucralose. Fructose is a natural form of sugar that is good for the human health. But even natural sugar in large quantity is bad for the body and health. Aspartate and sucralose are synthetic sugar that are only acceptable for the body in small amounts because large quantity of these sugars is bad for the health. Sugar build up has drastic effects of your body, ranging from weaker immune system to impaired insulin secretion and higher risk of diabetes. So you really need to look out for the sugar content in a product, irrespective if it’s natural or artificial. Modified food starch: Modified food starch is also called starch derivatives. Modified food starch is made by chemically, enzymatically and physically alternating native starch. Modified starch is not only used in foods but it is also used in pharmaceuticals. Modified food starch is used for emulsification, stabilization and thickening of food products. Starch also helps change the texture of the food products. The excessive use of modified starch in any form is bad for the human health. It’s interesting that activia claims to improve gut health, but too much starch can actually lead to change in bowel habits, stomach cramping and flatulence. Modified corn starch: It is also called corn flour or maize starch. Corn starch is made from the corn kernel. The kernel is dried and grounded into a fine powder. Modified corn starch contains various additives that alter the corn starch both physically and chemically. Corn starch is used to make corn syrup and various other sugars. Corn starch is a popular ingredient in the food industry for its ability to add texture and thickening effect. Corn starch is used in soups and sauces to thicken it. Corn starch is used in activia yogurt to give the yogurt more thickness and to increase viscosity. Kosher gelatin: Gelatin is a translucent and flavorless food substance that is derived from the collagen of animal by-products, like bones. Gelatin is not only used in food industry, it is also widely famous for its uses in pharmaceuticals, cosmetics and photography. It is used as a gelling agent, which means to increase the viscosity of the food product. Gelatin is mostly derived from pigs but its use in yogurt is not allowed in many countries. An alternative to pig gelatin is the gelatin that is derived from the kosher species fish. Kosher gelatin is permitted for use in yogurts and various dairy products (1). Agar: Agar is a jelly like material that is derived from seaweed (algae). Agar is translucent and mostly flavorless. It is used as an organic substitute for gelatin in food, cosmetics and pharmaceutics. Agar is most sold in form of powder. It has the same function as gelatin i.e. to gelatinize the food product and increase its consistency. Agar is used in custards, jellies, yogurts and other dairy products. Agar is mostly composed of fibers that are helpful to regulate the enteric system (gut) (2). Guar gum: It is also called guaran. It is derived from guar beans. The gaur beans are dehusked, screened and ground to obtain gaur gum. Guar gum is a white shiny powder. Guar gum is used in yogurts to thicken it, to maintain homogeneity of the product. Guar gum is also used to add texture to yogurts and ice creams. Lactic acid: Lactic acid is an organic colorless syrup that is primarily found in sour milk. Lactic acid fermentation is the most commonly used method to convert milk into yogurt. Lactic acid helps the coagulation (curdling) of milk. Lactic acid is the main ingredient in yogurts. Calcium lactate: Calcium lactate is a crystallized salt that is made by the combination of lactic acid and calcium carbonate. This salt can be either white or black in color. Calcium lactate is added in yogurt to add flavor and because of its ability to act as a preservative and stabilizers. Vitamin D: Vitamin D is a really important vitamin for the human body. It helps in the absorption of calcium from blood into the bone to help increase bone density. This helps prevent various disorders and diseases. Vitamin D is added to yogurt to enhance its nutritional value. Sodium citrate: Sodium is made by reaction of sodium with citric acid. Sodium citrate is a white colored salt. It adds a slightly sour and salty taste to food products. It is mainly added in yogurt for its function as a preservative. Gas: In medical terms passing gas is called flatulence and it is commonly known as farting. One of the main side effects of eating activia yogurt is the excessive gas formation. This is highly unconformable and embarrassing. Gas is due to the probiotics that are present in activia yogurt because of increases intestinal activity. Excessive gas can lead to bloating, pain and abdominal discomfort. Activia is full of indigestible carbs that are broken down in the gut into a lot of gases that are then passed out and cause abdominal distension and pain as well. Bloating: Bloating is the general swelling or distention of the belly. The person feel like there stomach is full and tightening. Bloating can be associated with abdominal pain and gas. There may also be increase in stomach growling sounds as well. Consuming activia yogurt leads to bloating due to the increase intestinal function associated with probiotics in the yogurt. It’s also the result of bacteria breaking down sugars in the food. Short bowel syndrome: Short bowel syndrome occurs when the part of the intestine has to be surgically removed for any reason leading to malabsorption of nutrients. As intestine serves as a site where the nutrients are absorbed, decreased intestinal length leads to decreased ability of the body to absorb nutrients. If you’re someone who has got a part of the intestine taken out, you need to be extra careful with what you eat. If a person has this condition then it is advised to stir clear to activia yogurt. The probiotics present in activia yogurt may not be useful for people with short bowel syndrome. Activia yogurt increases the likelihood of infection in people with this syndrome. Moreover, as the use of yogurt increases the intestine motility, it gives the intestine fairly less time to absorb available nutrients from the food. Now combine increased intestinal motility with decreased intestine length. This combination can lead to severe deficiency of vitamins and iron in such individuals. Also, increased risk of diarrhea may also lead to severe dehydration in some individuals (3). Non vegetarian: Activia yogurt is a non-vegetarian product. Although some people claim that activia is a vegetarian product because it uses kosher gelatin instead of plain gelatin. But what most people don’t know is that kosher gelatin is obtained from kosher species of fish and not from any plant source. So activia yogurt is a no go for vegans and vegetarians. Abdominal discomfort: Abdominal discomfort is the main complaint of the people who consume activia yogurt. This is due to the activity of probiotic in the stomach and intestine. Abdominal discomfort is not only painful but may also be associated with gas and bloating. Abdominal discomfort not only makes people irritable but also hinders the ability to sleep peacefully. Immunocompromised patients: Immunocompromised people are those whose immune system does not work properly. Activia yogurt contains probiotic that are considered healthy for people with intact immune system. Whoever in people who are immunocompromised, even these beneficial bacteria can cause serious infections. The immune system helps regulate the amount of bacteria in the intestine but is the immune system is defective then the bacteria grown unchecked and may wreak havoc on the body. If you’re someone on an immune suppressing therapy, like patients with rheumatoid arthritis or HIV, use of activia products can lead to serious consequences. Possible cancer risk: The major ingredient in activia yogurt is milk. Milk when consumed in large quantity and with additives can lead to some major side effects. Research has shown that both ovarian and prostate cancers are related to excessive intake of milk. Lactose intolerance: This is another complication of using too much activia yogurt. The proteins naturally found in milk is called lactose. This milk is broken down into digestible sugars in the gut. But in people with lactose intolerance, this enzyme is quite deficient. This may not sound like a lot of trouble to you, but people with this condition end up in a serious condition when they consume milk containing products. Indigestion of lactose leads to severe diarrhea, extremely painful abdominal cramps and flatulence. If you’ve this condition, use of acitiva is certainly not good for you (4). Infants: Activia yogurt is not a good part of diet for infants. Activia yogurt contains probiotic that are useful and helpful for an adult. But the immune system of an infant is not yet fully developed, so introducing foods with probiotics in their diet can lead to sever disorders. The one danger with giving infants activia yogurt is the advent of a bacterial infection. There are only a few strains of probiotics that are allowed for use in new born infants and the ones used in activia are not useful. Sugar content: All the different types of activia yogurt contain sugar. The plain activia yogurt contains fructose that is a natural sugar that has no significant side effects but too much sugar can lead to obesity, which in turn leads to many serious diseases. The light variety of activia yogurt contains aspartate and sucralose as sweeteners. These are synthetic sugars that are not good for the body in the long run. Time to work: Activia yogurt claims that is not only helps improve the regulatory function of the enteric system (intestine and stomach) but also improves the overall health of the person. Activia yogurt does not show a positive effect on the regulatory function of intestine for at least 2 weeks. And those effects are said to only occur if you eat one pot of activia yogurt daily. This is a long time to wait for the effects to show. Possible ineffectiveness: There is a chance that some people that consume activia yogurt may never experience the health boosting effects it promises to the people. The manufacturer claims that in order to heap the full benefits of the product you need to have a proper diet and healthy lifestyle. Most of the people that eat activia yogurt may not follow a proper diet plan or they may life a sedentary life style. So in short if you don’t follow an ideal diet plan and life style than activia won’t work for you. Presence of corn starch: Modified corn starch is added in activia yogurt to add texture and to increase the viscosity. The presence of modified corn starch is not good for the human health. Too much starch in diet leads to raised blood pressure that may cause heart diseases. Excessive use of corn starch is also responsible for weight gain and increased risk of cancer. Presence of agar: Agar has the ability to swell and obstruct the gut. Activia yogurt contains agar that adds texture and thickens the food product. Activia yogurt is contraindicated in people with any type of bowel obstruction. Agar containing food products should also be avoided by people who have any thyroid condition because agar contains high amount of iodine. Presence of guar gum: Guar gum is a white powder that is added to activia yogurt to maintain the homogeneity of the product. Activia also adds texture and increases the viscosity. Guar gum can cause gas production and loose stools. Large dose of guar gum can have hazardous effects on the health like obstruction of the esophagus. Should you eat activia yogurt daily or not? Do not get fooled by advertising. Food manufacturers just want to sell more of their products so they will make claims, which are not always accurate or do not work, unless you "lead a healthy lifestyle". If you actually lead a healthy lifestly your health will improve regardless the fact whether you consume activia yogurt daily or not. Consuming activia yogurt from time to time is okay but it is not necessary to have one every day as it may actually be harmful. If you experience any gut problems (diarrhea, bloating, vomitting, etc.) after eating activia yogurt you should stop eating it immediately and see your doctor. Always ask your physician for advice before adding activia yogurt to your regular diet.